It was here, during World War II, that Allied Prisoners Of War soldiers (POWs) were subjected to harsh treatment at the hands of their Japanese captors. Changi Prison is still in use as a correctional facility and it is now the place of execution for convicted drug offenders. 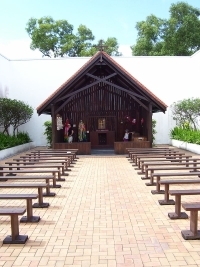 Half a mile (1km) from the old site, next to the prison, is the new Changi Chapel and Museum. The complex is dedicated to all those who suffered and died in Singapore during the war and the war graves are a sombre and moving reminder of the sacrifice made by many. The display of photographs, letters, drawings and other personal artefacts in the museum are a profound tribute to the tragic legacy of the Japanese occupation. During the occupation, which spanned three and a half years, more than 50,000 civilians and soldiers were captured and imprisoned. Visitors have access to a variety of videos and literature relating to the war years. A British POW returned to the museum to faithfully recreate the chapel murals which gave the prisoners hope and comfort during their incarceration and seeing them is one of the highlights of the trip. To peruse the artefacts properly you will need at least two hours.